A fair is taking place in front of the façade of the School of San Marcos (adjacent to S.S. Giovanni e Paolo, which does not appear in the scene), a masterpiece of the Venetian Renaissance (by Pietro and Tullio Lombardo and completed by Mauro Corlussi) of which only the three western arches appear. We see a varied group of people, some standing and chatting, while others, close to the fountain, are raising a banner. Three other figures, close to the pier, are carrying a pole or playing cards. Meanwhile, another figure is gesticulating from the adjacent Ponte del Cavallo which crosses the Rio dei Mendicanti. This painting reappeared in 1981 together with its pendant, Capriccio with Colonnade in the Interior of a Palace at a Sotheby's auction in London with the provenance given as "The property of a Lady", but with the specification that both works were part of the owner's family collection since the end of the 19th century. The fact that the pendant painting corresponds with a canvas of the same subject matter dated in 1765 and in the Gallerie dell'Accademia in Venice leads me to date the two Thyssen paintings to the last years of Canaletto's life (he died in 1768). There are two youthful views by the artist of the Campo Santi Giovanni e Paolo and of the School of San Marco, both of which are horizontal and of large format. One of these is in Dresden at the Staatliche Kunstsammlungen GemÃ¤ldegalerie (125 x 165 cm) while the other belongs to a private collection formerly in Montreal, the estate of the late Elwood B. Hosmer (90.5 x 135.9 cm). Both belonged to Stefano Conti of Lucca, an ambassador to the Emperor, and are documented in 1725 and 1725-1726 respectively. The view of the School of San Marco was executed from a slightly distant angle but close enough to show all the steps of the pier and two figures that are similar to those that appear in the same place in the Thyssen painting. However, instead of playing cards, one of these figures is shown from the back with his left arm leaning against the low wall, while the other is shown in profile from the left while his right arm points at the water or at the gondola and his left arm leans against the wall. In both paintings that used to belong to Conti the central banner is repeated close to the fountain near the entrance door to the School. In the Thyssen painting, which was painted forty years after these models, the perspective is so dense that the circular form of the steps underneath the doorway cannot be seen. Furthermore, the Ponte del Carvallo is complete with its steps and its access platform, while in the case of the older Conti views these elements appear only in a sketched form or do not exist (in the Dresden view there is even a wooden footbridge). 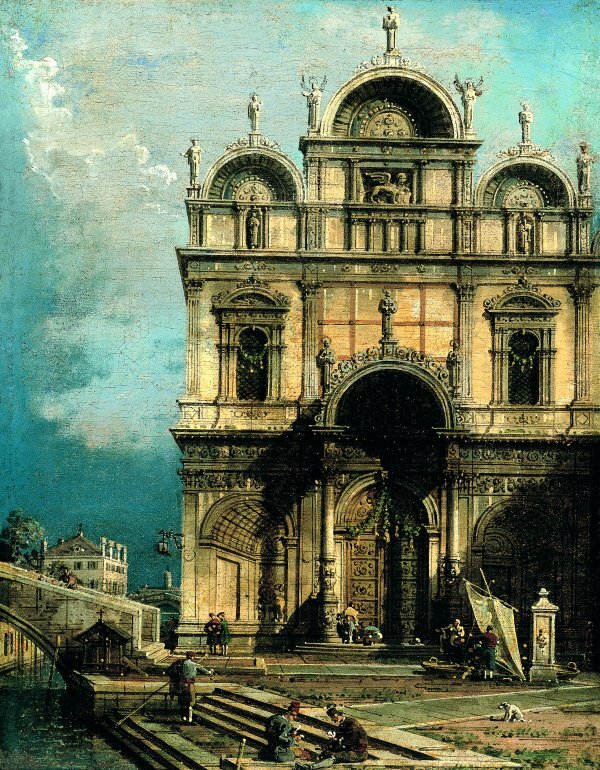 Having a single building as a main compositional element -in this case the San Marco School- makes it tempting to relate this painting to other "single building paintings" that are generally later works. For example, The School of San Teodoro (formerly London, John Ward Collection) is very similar to this work in its compositional treatment and plan even though the perspective is less secure and the depiction of the figures more sketchy. Furthermore, the size (41 x 31 cm) is almost identical to that of the Thyssen canvas, which makes us suspect that it belongs to an almost didactic series of famous Venetian buildings that are depicted both from the exterior and the interior. The Giants' Staircase in the Palazzo Ducale (Mexico City, Pagliai Collection), could also have been part of that series given its style and its size (42 x 29 cm), as could the Interior of the Basilica of San Marco -considered a pendant to the former- in the Museum of Fine Arts in Montreal. But above all the Venice: Piazza San Marco, 45 x 35 cm (London, National Gallery) could be seen as part of the same series. It is the best picture of the group and can be compared with the Thyssen pendant. It is in turn accompanied by a pendant: Piazza San Marco and the Colonnade, 46.5 x 38 cm (London, National Gallery).